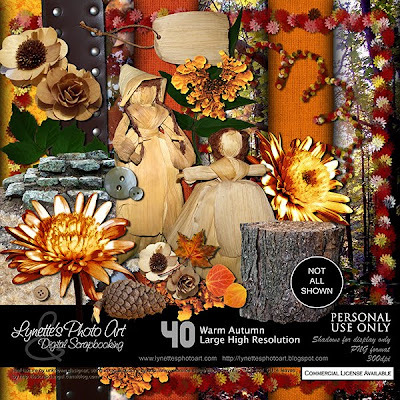 Warm Autumn has 40 unique and rich pieces, large and in high resolution for your fall layouts. Only $4.99 at my PayPal store. Click image to enlarge. Click Buy It Now Button below preview to purchase. Today I'm giving you a piece of this wonderful kit to try out. I made these corn husk dolls years ago. The gorgeous paper of fall leaves in a puddle was taken by my daughter. Leaf texture on yellow paper by unknown designer; string in tag & buttons by http://www.storeide.se/gunhild/index.htm; TMS_leaf_CU; 4 leaves by http://lescrapdangel.canalblog.com. Thank you! Your blog post will be advertised on the DigiFree Digital Scrapbooking Freebie search engine today (look for timestamp: 10 Sep [LA 04:00pm, NY 06:00pm, UK 11:00pm] - 11 Sep [OZ 09:00am]). Thank you so much for this Freebie. I want to let you know that I posted a link to your blog in Creative Busy Hands Scrapbook Freebies Search List, under the Page 13 post on Sep. 11, 2009. Thanks again.